** This post is written by chulet’s hubby. He kindly agreed to write one post after much begging from me… hehehe…Thanks dear! Even before we left our home country, the wife was going on and on about the eatery that her friend recommended. I thought I saw her salivating when the plane landed in Heathrow… or maybe it was brought on by the rather cramped and uncomfortable seats on the Airbus A380. I do not know if it is the same for other airlines, but I was rather disappointed with the humongous A380 that took a significantly longer time to seat all its passengers in those tiny little seats. 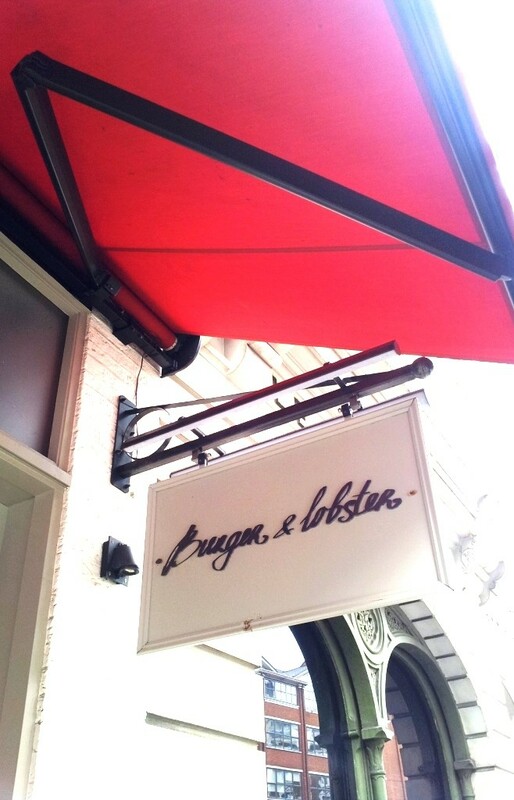 So anyways, we met up with her friend who gladly brought us over to a Burger & Lobster joint. Apparently, there are several outlets in London. Hmm… a chain restaurant? I mentally prepared myself to console my poor wife who loves good food, but is devastated after any under-promised dining experience. The first impression was very decent actually. I felt the facade looked like a reasonably classy cafe or restaurant. Stepping in was even better, it had a nice clean environment – lots of wood but nothing tacky, and a layout that featured a bar but still managed to maintain a comfortable dining ambience. We were shown to our table near the back of the restaurant and I enjoyed the natural lighting that lent a picnic-like atmosphere. There is no menu. Well, no FOOD menu anyways. Already on the table was the drinks menu and we got the friendly waiter to explain that there are only 3 food items on the menu – whole lobster, lobster roll or the beef burger. 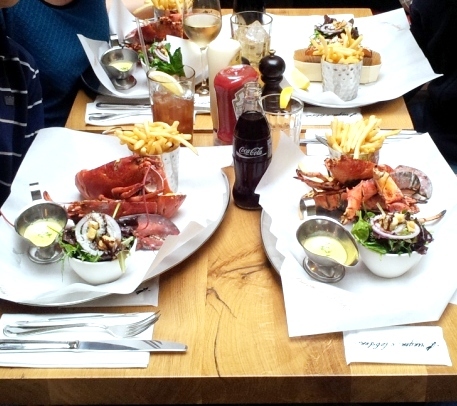 Hence their name: Burger & Lobster. We all went for the variations of the lobster. 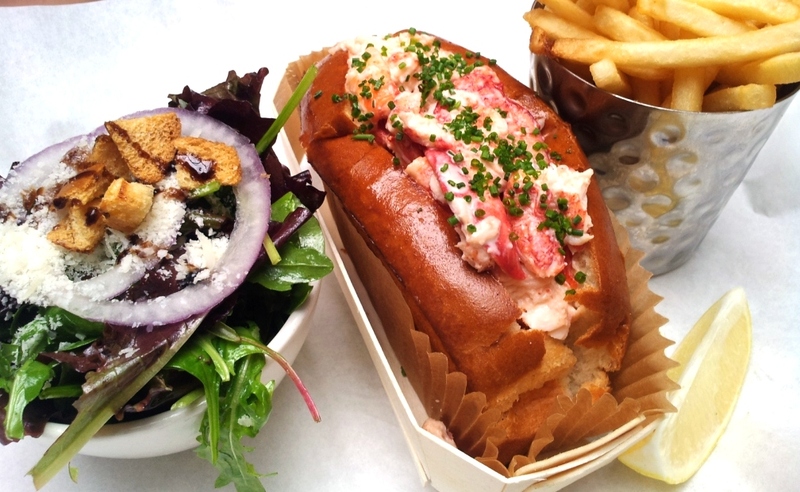 We had the steamed lobster, the grilled lobster and the lobster roll. There was a choice of butter or garlic butter as the sauce, but that is a no brainer to me. Garlic butter of course! Just to get it out of the way, the garlic butter was good! Very fragrant and creamy. The lobster was even better! Steamed, grilled or chopped up in the roll, it made no difference – all delicious! 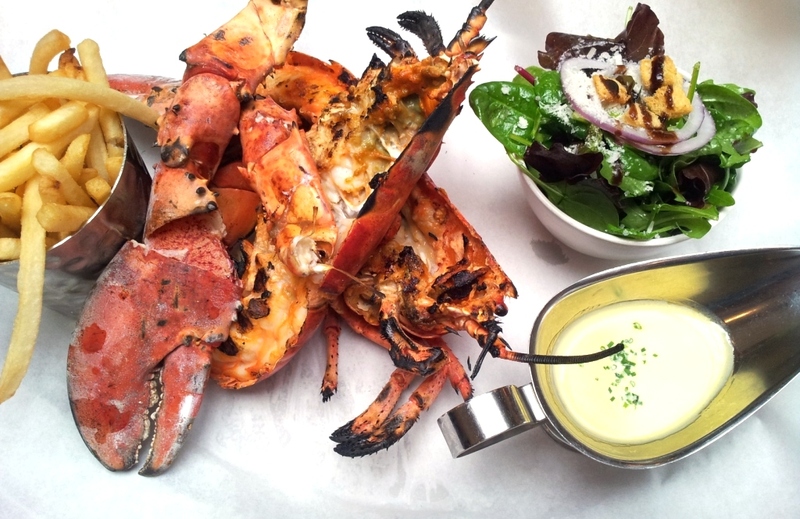 The steamed version kept most of the natural taste and sweetness of the Boston lobsters. The grilled version gave it an additional grilled (well…) and creamy flavour. The roll contained a convenient (for those of us too lazy to “strip” the lobster shell) and yummy mix of tender lobster meat and dressing. And only ONE price. £20 for any food item. I think it’s a great deal for friendly service and well-prepared food! Delish! And yes – the Wife is HAPPY !